VERONICA BENNETT, ESTELLE BENNETT AND NEDRA TALLEY. THEY WERE ORIGINALLY CALLED "RONNIE AND THE RELATIVES"
AND THE GRAMMY WINNING "WALKING IN THE RAIN"
WITH THE GIRL`S BEE HIVE HAIRDOOS AND SLINKY, SULTRY LOOKS, BACKED BY PHIL SPECTOR`S "WALL OF SOUND", THEY BECAME POP MUSIC`S "BAD GIRLS OF ROCK AND ROLL". RONNIE EVENTUALLY MARRIED PHIL AND TOOK HER PLACE IN POP HISTORY AS THE REIGNING QUEEN TO PHIL`S KING . BUT UNFORTUNATLY, THE MARRIAGE DIDN`T LAST AND THEY WERE DIVORCED IN 1974. RONNIE WENT ON TO PERFORM SOLO ON A MYRIAD OF RECORD LABELS WITH LITTLE SUCCESS , SHE RECORDED "SAY GOODBYE TO HOLLYWOOD" WITH THE E STREET BAND WHICH WAS WRITTEN FOR HER BY BILLY JOEL . 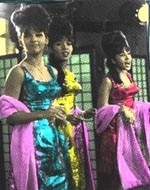 AND AS TIME WENT ON , SHE , ALONG WITH THE OTHER TWO RONETTES SUED PHIL SPECTOR FOR BACK ROYALTIES ON THEIR HITS THAT EVEN TODAY ARE HEARD ON VARIOUS TELEVISION COMMERCIALS AND MOVIE SOUNDTRACKS. RONNIE IS REMARRIED TO JONATHAN GREENFIELD AND CURRENTLY RESIDES IN THE CONNECTICUT AREA. NEDRA TALLEY IS MARRIED TO A MINISTER FOR THE CHRISTIAN BROADCASTING NETWORK AND ESTELLE HAS A STAKE IN THE RESTAURANT BUSINESS ON THE EAST COAST.